In 1982, Raymond Feist launched himself into the world of fantasy with the publication of MAGICIAN. With that novel, he successfully began one of the most praised and enjoyed series of modern fantasy, The Riftwar Cycle. 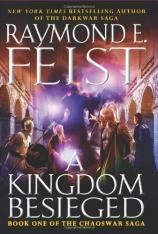 Twenty-nine years and 26 books later, Feist gives us A KINGDOM BESIEGED, the next installment in the massive arc in the worlds of Midkemia and Kelewan and the initial volume of the Chaoswar Saga. A brittle peace exists between the Empire and the Kingdom following the Demonwar. Now, Kesh spies from the Kingdom have begun to infiltrate the Empire, but their information has been slow to return. The spies are disappearing, having either turned to the side of the enemy or having been killed. In no way can the truth not be seen: darkness and foul deeds are compounding, and the Kingdom becomes rife with the rumors and fear of war once more. Pug, the great wizard of Midkemia, had enforced a peace between the Empire and the Kingdom with the help of the Conclave of Shadows. That peace is considered to be in force, but word comes from Jim Dasher that the peace is merely a ruse. Large forces are massing in the Keshian Confederacy. This information comes too late, however, and the Kesh begin an invasion, overtaking villages and moving on the key stronghold of the Kingdom, the estate of the Duke of Credy. In the midst of this siege, Pug finds himself drawn to another, more curious rumbling. Something is amiss in the Demon Lands. Torn by two concerns, Pug decides he must go to the Demon Lands and determine the level of threat. While the Kingdom is on the verge of falling, he is more disturbed to learn that the Demons are preparing to enter Midkemia, thus threatening all of human existence. A KINGDOM BESIEGED is said to be the beginning of the final installment of Riftwar titles, and, as such, it is essentially rolling out the carpet and laying out the groundwork for the influx of action to come in the following two books of the line. There's much to enjoy here from a worldbuilding aspect, and there are many characters that criss-cross their way through the story. On occasion, the varied points of view can get a tad confusing, but once you settle in your mind who the key players are, it is not nearly so troublesome. Pug, the wizard, is the only character from the old days left on the page. Feist drops some names, recalling characters long gone, but this is essentially a new cast. The storyline itself is compelling enough, if sometimes a bit slow, and builds nicely as more of a recipe for disaster, as it were. A few surprises are dropped into the threads of the tale, and they set things up for what will be a more explosive second and third volume. It is possible to pick up A KINGDOM BESIEGED without having read the previous 20+ novels in the line. What you miss, though, is all of the background that makes such a lengthy series so much fun in which to become enveloped. Feist has been taking us through Midkemia for quite a long time. The results have fluctuated between the very impressive and the minor shoulder shrug of interest. With A KINGDOM BESIEGED, as Feist begins to say goodbye to the old world he's shared with us, he puts on a strong effort and settles everyone in nicely for the events to come. Should he continue in this style, the farewell to Midkemia will be a well-represented one.